Somehow, I've lost track of the days this month. I mean I think my heart literally did a somersault when I realized today was the 13th (less than 2 weeks 'till Christmas!). I should've realized it sooner too, since the past couple of times I've gone shopping (during the day mind you) there's been a ton of shoppers out. Hopefully, you've all got your shopping lists whittled down to just a few last gifts, but if you're still having some trouble, then I hope my stocking stuffer holiday wish list helps you out. #6 might seem a bit difficult to get into a stocking, but they were just so pretty and inexpensive that I couldn't leave them out! 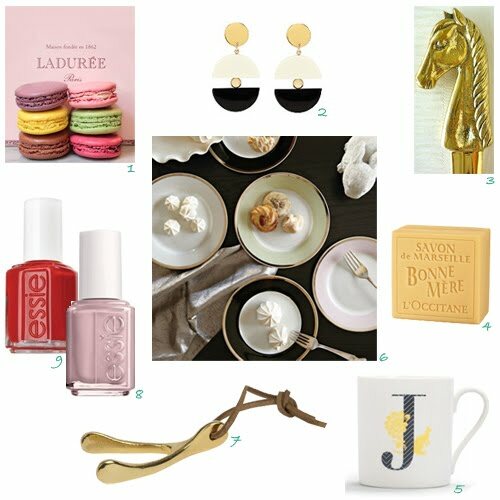 I know that if any of the items above made it to my stocking, I'd be one very happy girl, hint hint. I think your husband had the same reaction on a conference call this morning when someone told him he had less than 2 weeks until Christmas - busy (but exciting!) times in the Johnston household! ahh perfect stocking stuffers. I mean, I could have a stocking full of macarons and be a pretty happy lady.